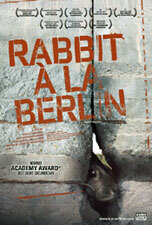 RABBIT A LA BERLIN is the 2010 Academy Award-nominated story of thousands of wild rabbits which lived in the Death Zone of the Berlin Wall. This is the first film showing the story of the Wall and the reunification of Germany seen from such an unusual perspective - from the rabbits' point of view. As if the green belt between the two walls was designed for those animals - full of untouched grass, the predators stayed behind the wall and the guards made sure no one disturbed the rabbits. They had been living there for 28 years, enclosed but safe. With the fall of the Wall in 1989, the rabbits had to look for another place to live. RABBIT A LA BERLIN is an allegorical, self-described "nature documentary about socialism" which brings together the history of Eastern Europe as seen from the rabbits' unique perspective. "The film is funny, witty, perverse, and yet seems perfectly balanced. An examination of German Jewish life and culture and the lasting intellectual, moral and spiritual void that loss has meant to their fatherland.